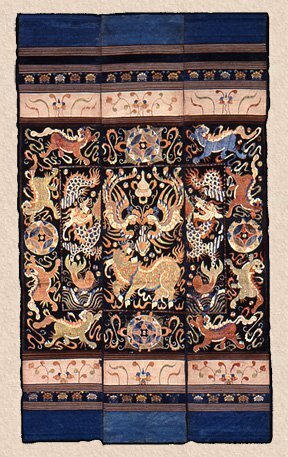 Ceremonial Dragon Covers of the Li of Hainan, around a dozen years ago, embroidered panels attributed to the Li, a tribal group living on the island of Hainan, China, began to appear in Chinese markets. Filled with dragons and other Han Chinese creatures and symbols, they looked like something that might have come out of the Imperial Palace; but although their iconography was mostly Han and their overall size regal, there was something – a sense, a flavor – that felt tribal. The Li began spinning, weaving and dyeing textiles in ancient times. Over the centuries they developed a reputation for the quality and beauty of their textiles. Nevertheless, all of the Li textiles we had seen up to that point, though spanning a range of style and design, appeared to emanate from Li culture, tradition and religion, and to share roots with other Daic – speaking people: in short they appeared tribal. These were something else. In 2003, intrigued by the tapestries, called long bei in Chinese, I went to Hainan. Through research and interviews I concluded that they had originated as tribute to the Court in Peking during the Ming and Qing periods. But they also seem to have been cloaked in secrecy and to have led double lives. This talk, then, will explore the origin, function and mystery of these Li textiles, leaving the listeners to draw their own conclusions. Lee Chinalai and her husband Vichai have lived and worked in Thailand and Bahrain and traveled in Southeast Asia and China for their business, Chinalai Tribal Antiques. They have curated several textiles exhibits; and in 2005 received a Rockefeller Foundation residency to study magical drawings on cloth from mainland Southeast Asia. Lee attended graduate school in Asian Studies at UC, Berkeley, and has authored and co-authored a number of articles, including “Ceremonial Dragon Covers of the Li” and “Written in Silk, Meifu Li Head Cloths with Writing” for HALI Magazine. Lee has spoken about textiles at Textile Society of America symposiums, for the Textile Arts Council at the De Young Museum, for Textile Museum Associates in LA, and most recently at Collected Works in Santa Fe, NM.